Occupy Wall Street is still going strong after 25 days. 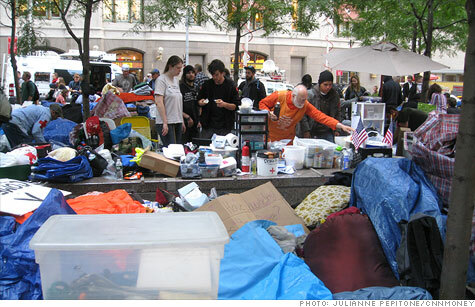 NEW YORK (CNNMoney) -- A lot of lip service has been paid to the idea that Occupy Wall Street lacks focus. The critics ask: What's the goal of these protests? Everyone wants something different. It's easy to trivialize Occupy Wall Street -- even as it inspires similar protests around the country -- by saying the movement lacks an end game. The group is trying to crowdsource its list of goals, which all but guarantees that no major ones will be set. A demand list of sorts has appeared on the official Occupy Wall Street page, serving as an ever-changing document on which people can comment with their own suggestions. It has also served as fodder for critics like Fox News, which posted a version of the list and suggested that readers "try not to laugh." But no list has been endorsed by the "general assembly" at Occupy Wall Street, says press team member Mark Bray, who added that "making a list of three or four demands would have ended the conversation before it started." Occupy Wall Street has already achieved what it set out to do. Like the "Arab Spring" uprisings that inspired its tactics, the word-of-mouth demonstration has tapped into a collective anger. Some protesters are upset about taxation; for others, the big issue is the high unemployment rate. Or corporate greed. Or the distribution of wealth. For all the individual reasons that draw people to Occupy Wall Street, a similar undercurrent ties the protesters together. They're upset about inequities in their country. They're angry. They want their voices to be heard. "The guys in Washington are supposed to be helping me, but they don't get it with their mansions and their millions," says an unemployed nurse at the protest on Wednesday, who declined to give her name. "They don't understand my situation and they don't want to hear me. Well, now they'll have to hear all of us." Lawmakers including President Obama have weighed in on Occupy Wall Street, with many sympathetic to the emotion behind the protests. Large labor unions, including the AFL-CIO and SEIU, have joined in. Media outlets are at the scene in droves. Even a corporate board has shown support: Ben & Jerry's directors released a statement "to express our deepest admiration." The mere fact that the protest is still going strong after 25 days is means it has met one of its goals: Organizers said from the start that they hoped to sustain their demonstration for two months. Occupy Wall Street's real goal has always been simple: Draw focus to the concerns -- and anger -- many Americans have about the country's growing economic gap, plant the seed of an organized voice, and let the protest evolve naturally. As part of that evolution, solidarity protests have popped up in Los Angeles, Boston, San Francisco, Denver and Chicago, among other cities. "We don't want New York to form its own political agenda and drive the conversation in other cities," Bray says. "I would be unhappy if people in LA or Chicago were waiting on us to do something. That would be politics as usual." That's why Occupy Wall Street isn't focused on a demand list, Bray says. "To tell everyone that we have the solution to their specific problems, that would be what the political parties are already doing," Bray says. "That isn't working. And that's the whole point." The original plan was to continue the occupation for two months, and then wrap it up. But Bray says that "has been entirely thrown out the window, and we have no set timeframe in mind." So what happens as the weeks go on? That's up to the crowd. Occupy Wall Street is a symbolic protest, but with the economy still sputtering and the wealth gap growing, it's a potent symbol.